What we have here is one of the early steps of preparing wool for the felted shower scrubby. If you haven’t read the first part of my report on the RTArt Camp, you can find it here. On the first Friday of the RTR, the RTArt Camp hosted its first workshop. 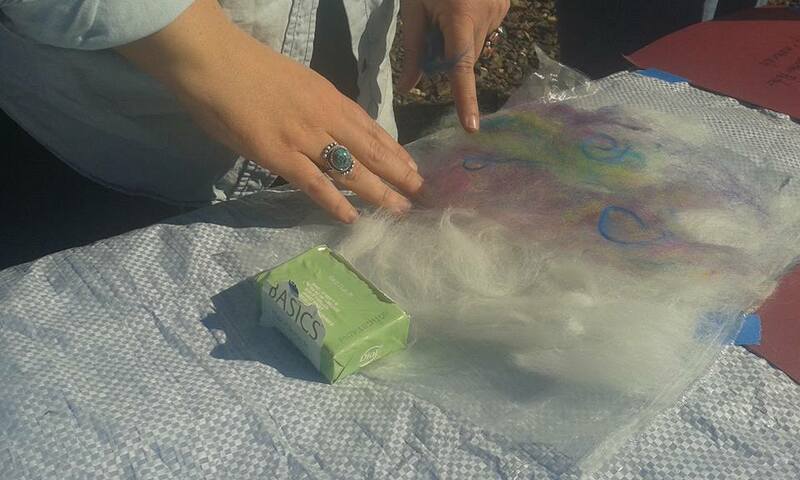 A woman showed interested folks how to felt wool on a bar of soap to create a shower scrubby. Eight or so people participated, and everyone seemed to have fun. The following day saw probably the most popular activity of the art camp. An artist staying in a motorhome with her husband just past Coyote Sue’s rig taught people how to do acrylic pour painting on canvas. More than a dozen people participated that day, and the activity was so well-received, the artist taught the pouring technique again later in the week. On Sunday, I led the first of two activities—finger painting! Ever since I’d agreed to help with the RTArt Camp, I’d wanted to offer finger painting. I thought it would be a good activity for people who didn’t consider themselves artistic. Also, I didn’t remember doing finger painting as a child, so I thought the RTArt Camp would be a good excuse to have the experience. I’d bought a three pack of eight ounce finger paints in primary colors so we could mix, as well as three rolls of freezer paper. I had high hopes, but turnout was rather small, maybe eight people. On the plus side, one big burly guy came over to finger pain particularly because he hadn’t done it since he was a child. We got him (as well as a male New Englander friend of mine) totally out of their comfort zones. 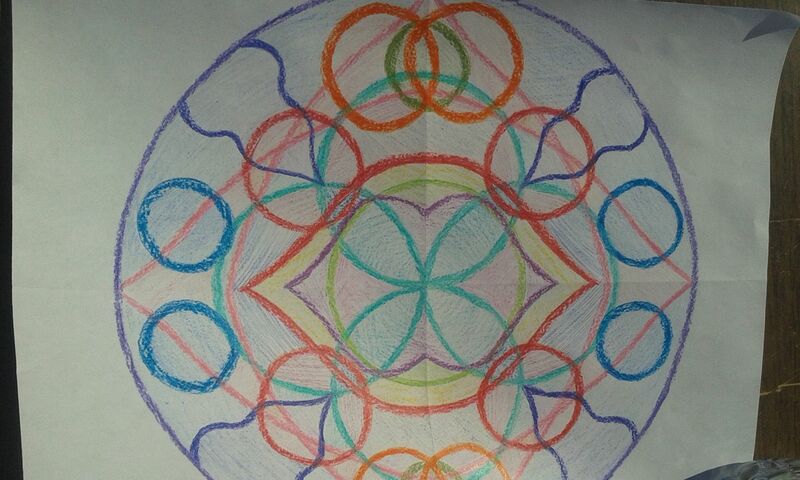 Here’s a mandala drawn during Coyote Sue’s class demonstrating an easy technique for drawing them. I’m not sure who drew this one. If you are the artist, please feel free to speak up in the comments. Monday brought Coyote Sue teaching an easy technique for drawing mandalas. The class was well-attended, and people seemed to enjoy the process. On Tuesday (or maybe it was Wednesday), the art camp had two classes going at once. One woman taught folks how to make beaded bracelets as a follow-up to her class on embroidering beads onto watercolor paper which happened before finger painting on Sunday. Another woman taught crochet. She was able to help beginners with the basics and give more advanced instruction to folks with experience. It was really cool to come back from town that day and see people sitting all around our tables. Thursday was another popular day at the RTArt Camp. A monk (for real!) led a pencil drawing workshop where he demonstrated techniques for making life-like art. Probably a dozen people spent time drawing according to his instructions. 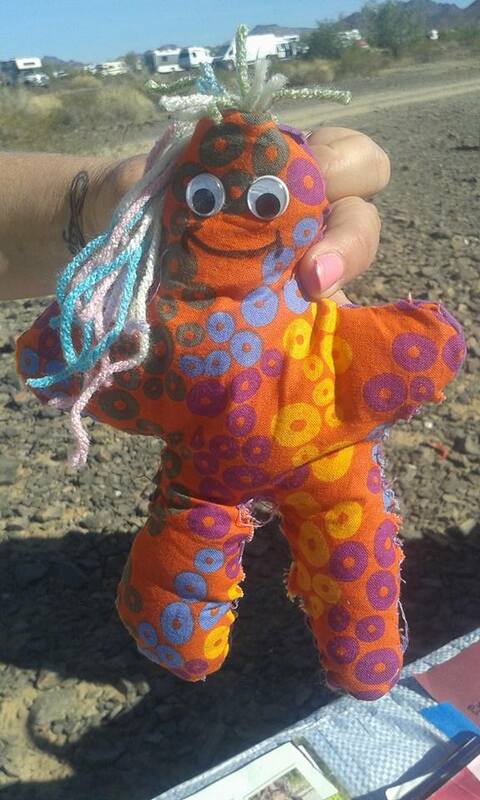 This positive voodoo doll was made by a mom on the road so she could send loving energy to her kid. The crochet lady was at it again on Friday at a voodoo doll making workshop. She donated materials (fabric, fluff) and her expertise so people could make voodoo dolls. Several people said they were making replicas of political leaders, while one woman made a “positive” voodoo doll representing her daughter. She planned to use the doll to send her child love and Reiki healing from the road. Saturday was my big day—collaging! Unfortunately the day turned out to be cloudy and windy. By 11am, the sun was peeking out, but the wind didn’t cease until after we got some rain. Thankfully, the wind had chased away the few participants before the rain began, and Coyote Sue and I had divvied up and packed away all the art supplies before anything got wet. The RTArt Camp was over. While it was easier to meet people at the RTArt table because we already had something to talk about, there was more talking to strangers than I was comfortable with. Not only did I have to speak to people who were interested in what we were doing and wanted to participate, I also had to speak to people who treated us as a general information booth. I didn’t mind when people asked where the labyrinth was or where Nadia was camped; what I minded was when I politely said I didn’t know and people persisted in their questioning. I never had time to go looking for the labyrinth and Nadia never introduced herself and pointed out her rig, so I wasn’t able to offer the detailed information people wanted. These are jars I decorated during downtime while staffing the RTArt table. I got the beads at the free pile, then sorted them according to color. 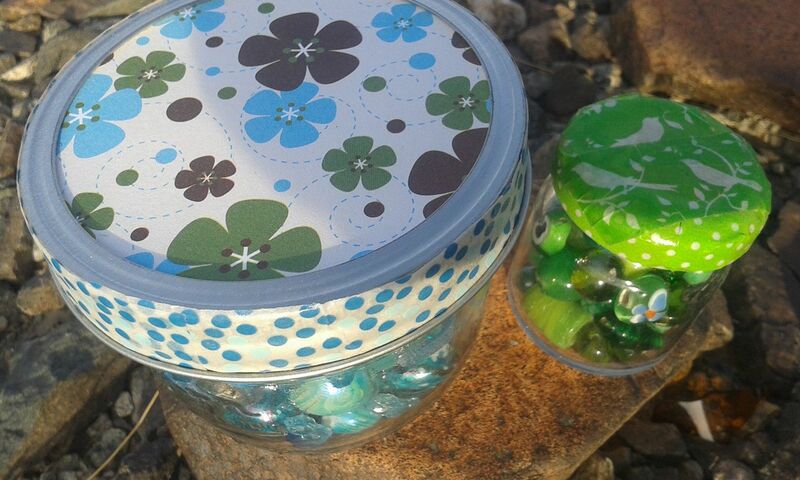 The jars came from the free pile too; I decorated them with pretty scrapbooking paper and washi tape. Fun! Several great things did come out of the RTArt Camp. On the last day of the camp, Coyote Sue and I divvied up all the leftover art supplies, much of which was donated to us or came from the free pile. I ended up with a lot of really useful supplies other folks were done with. The second good that came from the art camp was getting to spend time with other cool, art-centric folks. As always, I enjoyed spending time and sharing ideas with Coyote Sue, and I met three other super cool artist. I know I’m in good company when I like everyone sitting around the campfire with me, and that happened more than once at the RTArt Camp. Probably the best thing that came out of the RTArt Camp was a nomadic intentional community for artsy rubber tramps. Different subgroups of the community camp together and make art together. Folks come and go as they please and take turn being the go-to person in the group. I haven’t camped with the group yet, but I hope our paths cross someday. 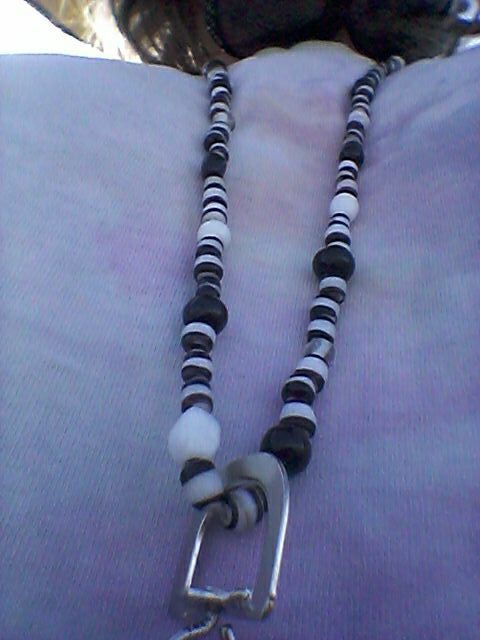 I made this lanyard from beads I got at the free pile. Do you like it? I’m willing to give it away to someone who needs it. I made it while staffing the table at the RTArt Camp. I said in my report on the 2018 RTR that my Rubber Tramp Rendezvous days are probably over. If I stick to the decision not to go to future RTRs, that means my RTArt Camp days are over too. While I did enjoy some aspects of the art camp very much, it also took a lot out of me. I might do better camping with a small group of like-minded rubber tramps. I took all of the photos in this post. Thanks to the artists who allowed me to share their work.